"Sam, I told you never to play that". Well, I played it in Rick's Bar in Casblanca. Well, as near as I could get to it. 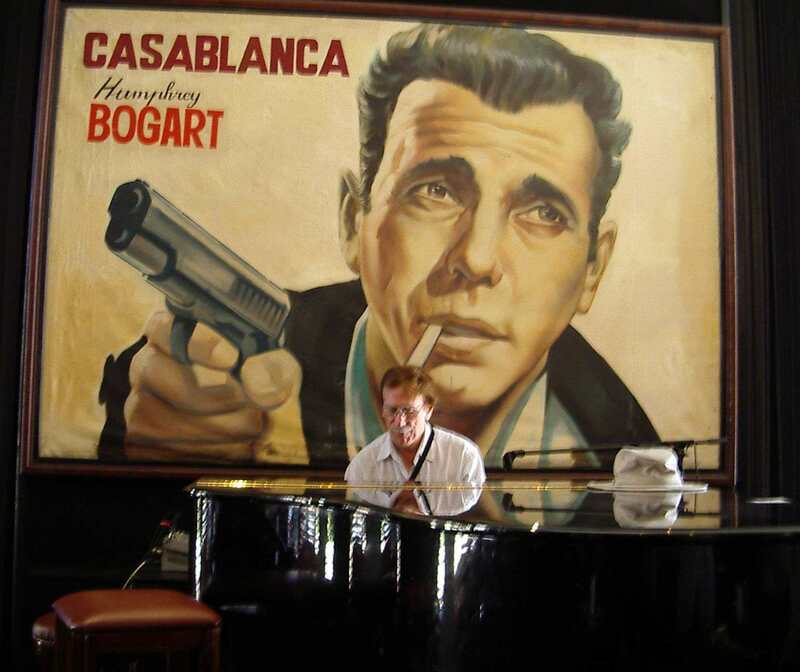 That bar was only a movie set but in the real Casablanca the Hyatt Regency have recreated it to their best ability with pictures of the stars all around the room and a grand piano on a podium. So I went and plonked myself down at the piano and played 'As Time Goes By'. I suppose that every pianist who passes through Casablanca does it and I have to compliment the staff who refrained from screaming, "Oh no, not again"! Anyway I did it and then I had an expensive beer and left, back to the ms Noordam for a six-day Atlantic crossing. Europe is interesting, exciting and, compared to Canada, horrendously expensive, especially Venice. Price of a beer in Venice? If you drink it standing up, eight euros. Sitting down, twelve euros. February, 2010 This diary has turned into a BLOG, Click here, Bob's Daily Grumble and a reproduction of Rick's Bar does exist now in Casablanca. I haven't seen it yet.